Our collection of Halloween bookmarks. Here are six free Halloween bookmark designs for you to print out on your computer. Just click on one of the designs, from those shown below, to open each of the full-sized printable images. If you’d like to print all the bookmarks at once (shown altogether, in the featured image, above right), I have created a free downloadable version of the Halloween Bookmarks from AllFreecrafts so that that you can view and print all the images on a single page. These Halloween bookmarks are free to print for your personal use only. Teachers may reproduce multiple copies for the use of their students, but please Do NOT copy or reproduce the images on other websites or groups, or use my bandwidth by linking to the image urls. 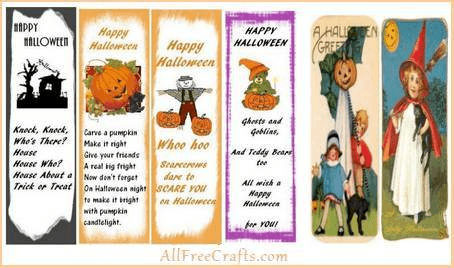 For more Halloween bookmarks, please see the Halloween Printables Page at our sister site, AllFreePrintables.com. There, you will also find a Halloween activity book, and free Halloween masks to print.